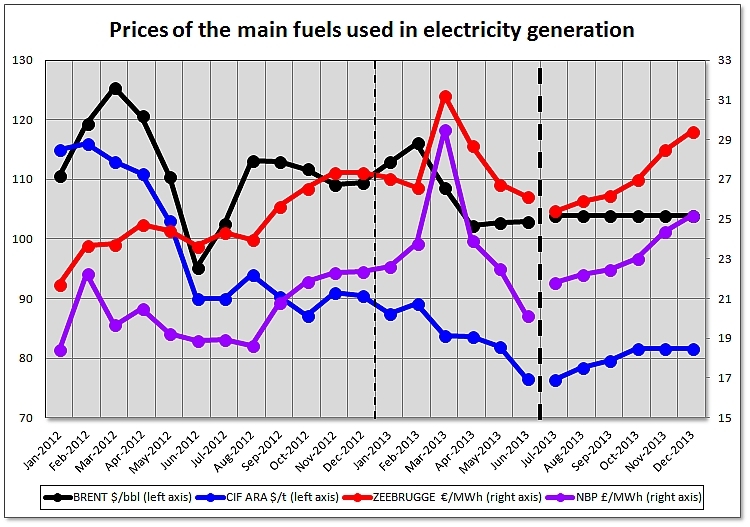 July 11, 2013.- The overall behavior of the main European wholesale electricity markets during the first half of 2013 has been characterized by a decrease in price. The high prices registered during February 2012 due to the cold snap that hit Europe have been crucial to record price falls this 2013 with respect to the first half of 2012. Although electricity consumption increased in March in some countries due to an abnormally cold month, the increasing proportion of renewable energies in the mix of many countries prevented a possible price increase in the first half of the year. Only N2EX market has seen an average price increase compared to the first half of 2012, conditioned by the low temperatures in the UK during March and the increase in the gas price. In the Spanish and Portuguese MIBEL market, the significant increase in hydroelectric and wind production combined with low demand during the Easter holidays led to historically low prices during the last days of March and early April. The month with the lowest average price was April with only 18.17 €/MWh in Spain and 16.08 €/MWh in Portugal. It was the second lowest monthly average in the market history. The increased production of renewable technologies smoothed and later stopped an increase of the day-ahead market price due to the entry into force of the new taxes on electricity generation. A study conducted by AleaSoft determined that the effect of the new taxes was an increase in the average price in January and February of about 5 €/MWh, but since March, they no longer had a clear impact in the market price. The average price of the first half of the year was 37.29 €/MWh in Spain and 35.97 €/MWh in Portugal. The first and second quarter saw an average price decrease of 10.31 €/MWh and 11.81 €/MWh in Spain, respectively, and 13.87 €/MWh and 13.53 €/MWh in Portugal. The French POWERNEXT market also recorded overall price drops in first and second quarter but not as pronounced as in the case of MIBEL. The half-year average price stood at 43.82 €/MWh. Quarterly averages fell 1.48 €/MWh in the first quarter and 7.91 €/MWh in the second quarter, compared to the same quarters last year. In March, the price reached a monthly average of 57.78 €/MWh (13.13 €/MWh year-over-year increase) due to low temperatures and nuclear unavailability. The average price in the first six months of 2013 in PHELIX market was 37.41 €/MWh. Large wind and solar renewable production softened the impact of low temperatures in March and prevented an increase in price that even recorded negative values in some hours. During the first quarter, the average price was 2.84 €/MWh lower than the first quarter of 2012, and in the second, 7.76 €/MWh lower than the second quarter of 2012. Among the main markets in Western Europe, the British N2EX market was the most sensitive to the low temperatures recorded in March. In fact, it was the only market with year-over-year monthly price increases in each month of the first half of 2013. The British benchmark NBP gas price recorded very high maximum prices during the cold snap, which in turn raised the price of electricity production. In average, in the first half of 2013, the price was 60.31 £/MWh (51.29 €/MWh). The average price for the first quarter was 62.81 £/MWh, 8.80 £/MWh higher than the same quarter of 2012, and in the second quarter 57.85 £/MWh, 3.64 £/MWh more than the second quarter of the previous year. In the Italian market IPEX, the average price during the first half of the year was 60.58 €/MWh. The Italian market price showed some convergence with the other major European markets, while historically it had significantly higher prices. The demand decrease and the increase of production from renewable sources are suggested as the main causes of the price fall. In the first quarter, the average price stood at 63.84 €/MWh, that corresponds to a difference of 17.40 €/MWh below the same quarter of 2012. 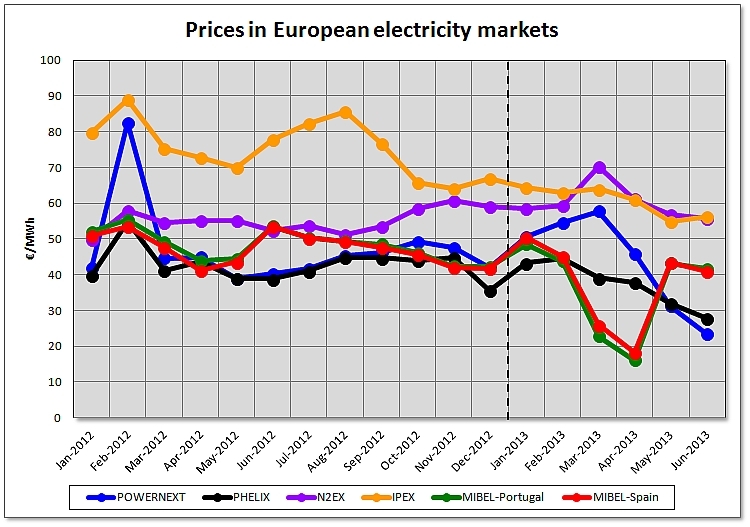 In the second quarter, the price dropped to 57.36 €/MWh, 16.12 €/MWh less than the same quarter of 2012. The following table shows the price forecasted by Aleasoft for the main European markets in the third and fourth quarters of 2013. This other table shows the growth in the price forecasted for each quarter with respect to the same quarter of 2012. The Brent barrel had an average price of $107.58 during the first half of this year, what represents 2.27 $/barrel less than the last half of 2012. In the first quarter, the average price was 112.51 $/barrel, and in the second quarter, it dropped to 102.34 $/barrel. Both Zeebrugge and NBP gas prices have been characterized by the high values recorded during March due to the low temperatures in Europe and the consequent increase in the gas demand. The average price in March was 31.24 €/MWh for the Zeebrugge gas and 29.50 £/MWh for the NBP gas, while the average of the whole half year stood at 27.76 €/MWh and 23.74 £/MWh, respectively. The price of European coal CIF ARA kept the falling pace from 2012. The average price of a ton of coal during the first half of 2013 was $83.78, $6.73 less than the last half of 2012. 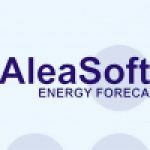 Sources: CIF ARA – EEX, BRENT – EIA, ZEEBRUGGE – NetConnect Germany, NBP – ICE ENDEX, Forecasts – AleaSoft. For the second half of 2013, it is expected that the price of the Brent crude oil barrel remains around $104. Regarding the price of gas, Zeebruge is expected to take an upwards trend up to 29.39 €/MWh at the end of the year, and NBP is expected to rise until the 25.16 £/MWh. For the CIF ARA coal, the price is expected to have a slight recovery up to 81.65 $/t. 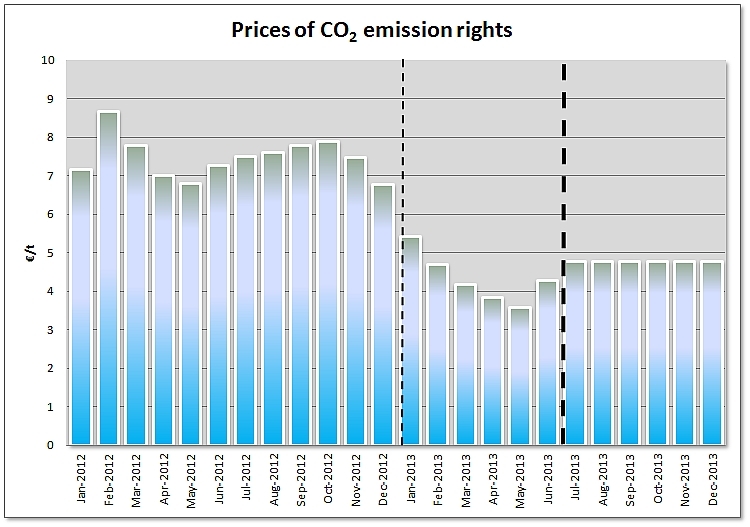 During the first six months of 2013, the price of CO2 emission rights kept the downwards trend of the last quarter of 2012. The average price during the first half of 2013 was 4.34 €/t, 3.18 €/t less than the previous six months. For the second half of 2013, a stable price is expected around 4.78 €/t. Sources: EEX, Forecasts – AleaSoft.